I feel a bit sheepish that this is the third of what will in all likelihood be four articles about Apple in a two-week span. I figured the scale of what Apple is planning to announce necessitated at least two preview posts; one about the iPhone and this one about wearables and payments. And then the iCloud theft happened, and well, here we are. At the same time, it’s difficult to overstate the broad impact that Apple has on the entire tech ecosystem, whether it be establishing categories it competes in directly or in fundamentally changing assumptions in others impacted by their wake (think the rise of mobility as a critical component of enterprise software). Moreover, it’s not as if these articles won’t be read; any blogger with access to their Google analytics panel knows that anything Apple moves the needle in a way few other topics do. Apple, of course, knows this as well, and what is so interesting about how they are approaching wearables and payments – together – is the way in which they are leveraging their popularity to make something that could not otherwise come into being. What is needed is something a lot better than a physical credit card and a critical mass of people willing to give it a try. People often mock any new Apple product by pointing out that, “Sure, the diehards will buy whatever Apple releases” before insisting that said product will never have broad appeal. We saw it with the iPad, the iPhone, and the iPod, and we’ll almost assuredly see it with the wearable. And, when and if people complain that only Apple fans will buy the wearable, Tim Cook and company are liable to nod their heads, knowing that that’s the point. There is the age-old question: “What came first, the chicken or the egg?”, and it’s one that is brought up again and again when it comes to building an ecosystem. For example, the biggest problem with Windows Phone is the lack of top-notch applications, but the reason that developers don’t prioritize the platform is that there aren’t enough valuable users, but there will never be enough valuable users until there are top notch applications. It’s a chicken-and-egg problem. As I noted above, the same problem exists in payments: merchants won’t support a new payment method unless lots of valuable customers insist on it, but said customers won’t insist on a particular payment method unless lots of merchants support it. Moreover, I’d bet the difference between using a wearable for payment and using your phone will be greater than most people expect. I have no particular evidence for this outside of my own experience with keyless ignition systems in cars; the first time we got it, I thought it was a tremendous waste of money (it was part of a package); since then, I can not imagine buying a car without it. Saving a bit of hassle and a few seconds on a daily basis really adds up; it’s the type of subtle experience improvement that is Apple’s biggest differentiation. 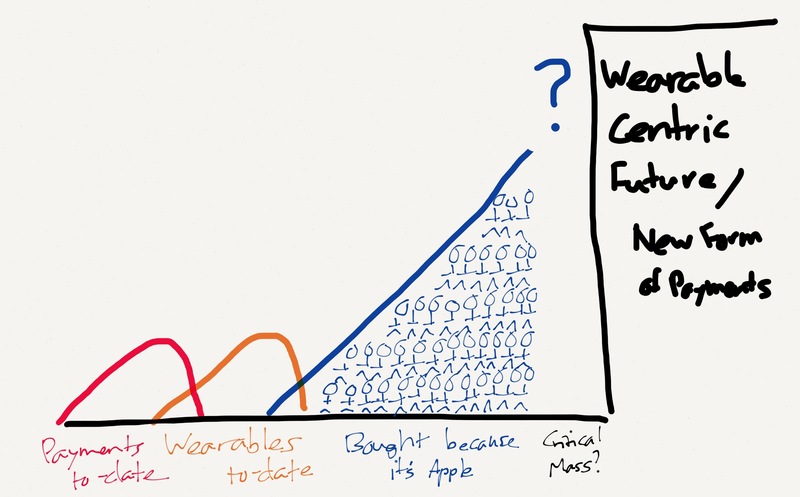 More broadly, this is the answer to the question of why build a wearable at all. 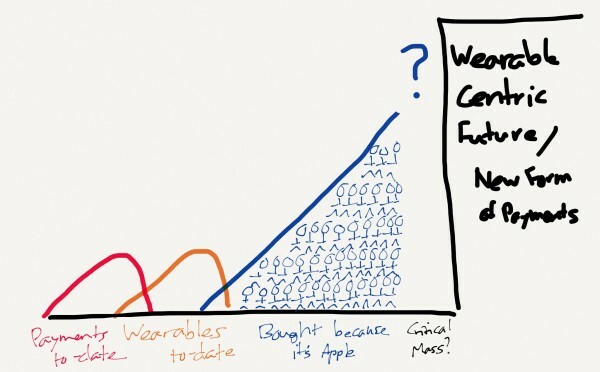 It’s easy to see a future where a wearable is the center of an entire ecosystem of devices and services; what’s hard is seeing how on earth we get from here to there. Unless, of course, customers give the device critical mass simply because it is made by Apple (even though they’ll tell themselves they buy it for their health). Apple has a better chance than anyone of creating a critical mass of users for a new payment system. Apple, not only because of its product capability but also because of its incredible customer loyalty, is uniquely suited to solve the payments chicken-and-egg problem and provide the killer use case for a wearable, all at the same time. Contrary to the expectations of some Apple bulls, I don’t think Apple has any interest in getting into financial services. I suspect they will be quite happy to sit on top of traditional credit cards, just as the iPhone sits on top of traditional carriers. In fact, when it comes to making money Apple’s strategy is remarkably straightforward: they sell devices for a profit; their services and infrastructure serve primarily to differentiate said devices. That is why I expect Apple to offer payment terminals to merchants for free or close to it, and to not charge any surcharge beyond what is necessary to cover credit card fees. Their payoff will be in the creation of a killer wearable use case, something that will ultimately benefit Apple as a wearable seller more than anyone. It will be fascinating to watch if Apple can succeed, and, if they do, what will happen to the companies in their wake. Just as the iPhone ultimately shook up all kinds of industries, including enterprise software, a true payments breakthrough will not only be the end of a whole raft of startups but could also have significant impact on all kinds of related industries. I suspect, though, all that matters to Apple is making life that much better for that many more people, something that is not only true to their mission but also results in a formidable strategic tool as well.